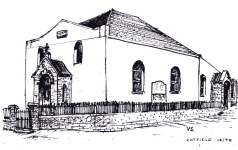 Catfield Methodist Church, built in 1836, is found on the corner of Church Road and Back Lane. Follow Church Road for about 150 yards from the Post Office/Shop in the centre of the village. The premises have been extended and improved to offer a comfortable modernised worship area with sound reinforcement and hearing loop system. Visitors are always welcome. Monthly luncheon club, usually on the last Wednesday. Advance booking essential!